After winning their respective Bridgestone British Masters’ classes in stunning style in 2018, the world’s number one tyre and rubber company is inflating Elliott Banks-Browne and Josh Gilbert’s presence in motocross to another level – in more ways than one. 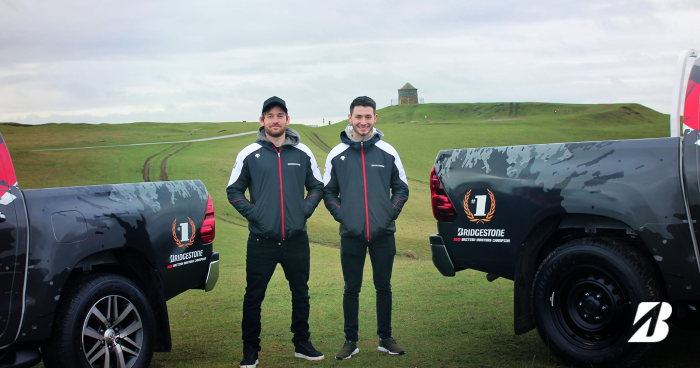 Fresh from their exploits in the MX1 and MX2 championships respectively, both Elliott and Josh can enjoy a year behind the wheel of a fully personalised and branded Toyota Hilux pick-up truck for 2019. The four-wheel prizes are amongst the first of their kind to be awarded to triumphant riders in any motocross series and it is hoped that they will raise the profile of the Bridgestone British Masters to even greater heights, leading to more competitive classes and even more exposure for the series. The same prize will be up for grabs for 2019 too! The unique investment is symbolic of a wide-ranging involvement in the sport and elevates the brand’s Battlecross tyres to even higher levels of significance. Bridgestone’s premium range of motocross products is increasingly viewed as being amongst the very best in motocross, with different compounds and tread patterns specially designed for the varied surfaces that riders compete on. The Battlecross X10 (sand and mud) X20 (softer ground), X30 (medium) and X40 (hard) products help to boost confidence when entering and exiting corners at speed, whatever the racing line. And in a second high-profile announcement, Bridgestone has also announced that it will be official tyre suppliers to the Geartec Husqvarna MX Team for the 2019 season. Their riders – double British Championship winner Elliott Banks-Browne, and multiple AMCA and IMBA Champion Luke Burton – will embark on a three-pronged tilt for silverware in the British Championship, MX Nationals and Bridgestone British Masters. “The tyres are absolutely brilliant. The back tyres are absolutely stunning and we’ve got to grips with the front to create the perfect set-up. It’s a damn good tyre range. “We’ve done lots of testing, spending two months testing tyres back-to-back and the decision to move to Bridgestone was the right one. The aftercare support that Bridgestone provides and the Battlecross range is second to none. “I usually run an X10 for the sand for the rear and stick with the X20 for the front, which also excels on the hard-pack. I feel that this is the best combination for me and I’ve been thrilled with the performance of the tyres. Members of the motorcycle trade can currently benefit from an early season deal on all adult Bridgestone motocross tyres, which runs until 28th February 2019. The deal is available exclusively from Cambrian Tyres. View the full Bridgestone motocross range here.